One 18 karat yellow gold Bucherer manual wind wristwatch. The watch has a square off-white dial with dot numerals and arrowhead numerals at every quarter (double arrowhead at 12 o'clock). Back Case: Anne-Mia Johnson 13.11.1955. 32644. Movement: Tevo unadjusted 17 jewels Swiss. 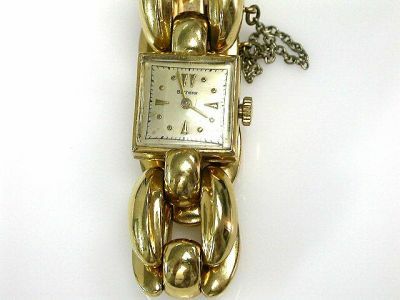 The watch is accompanied by an 18 karat hollow link bracelet and safety chain.